You quickly look at your lesson plans for the day. Soon, the bell rings, kids begin to arrive. The first kid who enters the classroom might say, “Who are you?” and you’ll tell this youngster your name. More students arrive, the volume of their voices echo loudly, you can hear other students whispering in excited voices that there is a sub today! As a substitute teacher you need a plan. You demand respect. Right? How do you quickly gain this respect and still have a great day substituting? By being positive and rewarding positive behaviors. Before accepting a sub job, go shopping! You don’t need to spend much. See if you can find tiny prizes. Kids adore cheap candies, or pencils, or whatever else you can find. 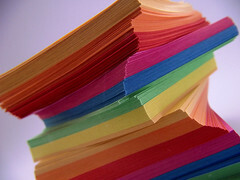 Oh, and you’ll also need a stack of small sticky notes. Here is your classroom management game plan for a great day. Greet the students at the door. Show them that you respect them. Now if they smile or say “Good morning” back at you hand them a sticky note and thank them in return. Soon you notice that some kids are actually sitting in their seat and quietly waiting for class to begin. Hand them a sticky note and tell them aloud, “Thanks for sitting quietly.” The other kids will notice this. At this point it’s probably a good idea to explain to them what the sticky notes are for. Explain to your class that throughout the day you’ll hand them out and if they receive one they’ll need to put their name on it. At the end you’ll hold a drawing for a few prizes. Of course, the more they show respect the more entries into the drawing they’ll have. Kids love competition. They'll show you posititve behavior because they'll want a prize in the end. Don’t you think they’ll also respect you because of the respect you’re showing them? Now the next time you come back the kids will remember you as that great sub who hands out prizes!